Sky Sports get a lot of stick, quite rightly, for much of their Newcastle United coverage. That embarrassing David Craig ‘interview’ with Mike Ashley at the start of last (2017/18) season being the very worst. They have also given Ashley other opportunities to put out other PR/propaganda, without challenging what he has said. As well as that, Sky Sports regularly give vile individuals such as Dennis Wise similarly unchallenged opportunities to defend Mike Ashley and have a go at the likes of Rafa Benitez and the Newcastle fans. However, this doesn’t tell the whole story, and of course many who work for the broadcaster or who appear as guests, don’t follow the same line as whoever it is makes the decisions to assist Mike Ashley as much as possible. This is summed up by a feature put up by Sky Sports ahead of the Cardiff match, which gives us some great stats and information about both Newcastle United and the transfer market, especially what happened this summer. 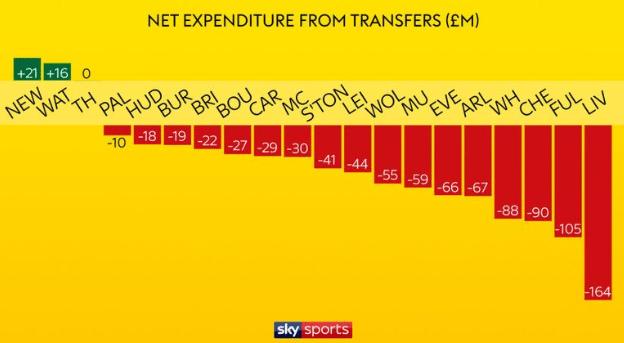 They reveal that 18 of the 20 Premier League clubs have broken their transfer records in the past two years, including 11 doing so this summer. “Bucking the trend, however, are Newcastle. Many Newcastle fans would maybe be thinking a word rhyming with ‘Bucking’ would be even more appropriate. In five transfer windows so far, Rafa Benitez has never spent £16m on any player, the most allowed has been the £12m spent on Matt Ritchie, when Newcastle were in the Championship!